SUMMARY: The IS 410 is a TV listening system that helps users change the volume and tone of their television sets, radios and hi-fi systems to adapt to their hearing loss. 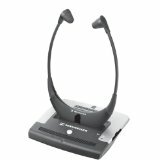 The system has a transmitter base that connects to your TV, and the audio is sent directly from the television to your ears via a stethoset-style headset. This system is intuitive and very easy to use. Balance and volume are set directly on the stethoset headphones. One of the standout features is a compression button on the transmitter that help enhances speech intelligibility, so conversations on TV are clear and easy to understand. PROS: The headphones are lightweight, comfortable and very durable. Sennheiser is known for the excellent sound quality of their headphones, and these are no exception. While they aren’t the cheapest product on the market, they are the least expensive of the Sennheiser TV listening systems for people with hearing loss. CONS: Since it uses an infrared signal, you need to have a line of sight between the transmitter/base that you attach to your TV and the headphones that you will wear for the system to operate correctly. For most people, this isn’t a huge problem, but if you move around a lot, a radio frequency TV listening system would probably be a better option. Sennheiser has an excellent reputation for high-end sound quality and great design. This particular model is one of their least expensive sets, although it isn’t exactly ‘cheap.’ The IS 410 uses an infrared signal (IF). It essentially means that you need to have the line of sight with the transmitter (that will be attached to your television) for you to hear the sound coming through the headset. 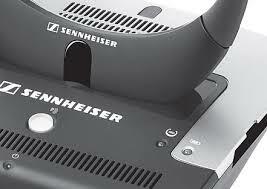 For hearing impaired users Sennheiser’s two most popular headset systems are the IS 410 and the more expensive 840 RF. The big difference is that IS 410 uses infrared, so you will need to stay in the same room as the TV to hear through the headset. While the 840 RF uses radio signal (RF), so you can wander around your house with the headset on and still hear the television. As I mentioned above, the IS 410 uses infrared signal, so the sound is transmitted within a room to a distance of up to 12m. What makes this headset ideal for uses with hearing loss is that it uses a compression function that makes sure that the speech intelligibility is very clear. The dialog is improved voice and becomes more easily understandable Understanding speech is one of the most challenging things for the hearing impaired when watching TV. The limitations of the infrared signal can be problematic with this headset and cause some issues with the sound quality being disrupted. The volume control on this set is also very sensitive. This model is a wireless stethoscope-style headset with a transmitter base that you attach to the back of your television. You also use the transmitter as a recharging base. The headphones are light and designed to hang down towards your chest (like a doctor’s stethoscope). The headset has its own volume control, which is a must with this type of television aid. It also is adjustable so you can find the right fit for you. When you are shopping for a TV listening system, one of the key features to look for is how comfortable the device will be for you. A big part of this is the style of the headset; if you watch a lot of television, you need to think about whether this style will be comfortable for you. Sometimes it takes a bit of trial and error to find what works best. Overall most users find this style of headset to be very comfortable If you wear a hearing aid, you probably won’t find these super comfortable, but some hearing aid users do use this headset style (you may want to consider a loop system or a wireless speaker if you would prefer not to wear headphones). Other than the issues with infrared signal, this is a great product. It is high quality, the sound is fantastic, and they are very durable. Most users find these to be a far superior product to TV Ears, as they don’t break as easily and are more comfortable. They also have a greater sound quality with clearer speech. Most of these types of TV listening systems are pretty easy to set up. The only caveat would be that you need to follow the manual carefully. The manual addresses the different types of TV setups that you might have and gives instructions for the most common problems you will run into during installation. When the system is set up, it is straightforward to use. It turns on when you pull the earbows apart on the headset and put the receiver on. When you take the receiver off, it automatically switches off. You adjust the sound on the headphones using the volume control, and you can enhance the sound quality by pressing the compression button on the base, to personalize the audio to your liking. To recharge the battery, you just place the headset back onto the base, and it will recharge within about three hours. The IS410 uses a lithium-ion rechargeable battery pack. It has a battery life of approximately 16 hrs. When you need to recharge the battery, you place the headphones on the transmitter, and it takes about 3 hours to charge. A lot of users like to purchase an additional Sennheiser rechargeable battery to have as a backup if the first battery runs out. Sennheiser is a German company that is a major manufacturer of a wide range of headphones, microphone, and wireless systems. They have really good user manuals, and also have a good reputation for product support. You can access their customer service through their website. The IS 410 is covered under a two-year warranty.